In June, Nick and Becky Boulton kindly donned their cycling shoes and took to the road on their bikes for the London to Brighton bike ride to raise money for TWOWEEKS. Inspired by the superhuman accomplishments of the amazing athletes at the Paralympics (including gold medallists Hannah Cockcroft, Divid Weir and Johnny Peacock), Nick, a public servant, and Becky, a pharmacist, wanted to tackle a challenge in the name of a good cause. We asked them to tell us about their experience and fundraising effort. For those who would like to add to their wonderful fundraising effort – you can visit the Virgin Giving site here. Tell us about yourselves – what do you enjoy doing? Becky: I love baking, and crafts such as sewing and quilting. I now have a great love of cycling (although it’s much more enjoyable on a fine sunny day). I also enjoy Kickboxing, street dance, yoga and Judo although most of the time I can be found bimbling around my home, cooking and reading or going to the cinema. Nick: I like to practice martial arts, read, watch films and train in the gym. Why did you choose to fundraise for TWOWEEKS? Becky: I have always wanted to get involved in aid work but as I have always had a full time job throughout my adult life I have never had the chance to pursue this dream. I love the fact that with TWOWEEKS, professionals can volunteer on a short-term basis, meaning that I can help out with a worthy project across the globe without having to take a sabbatical from work. So when I decided that I wanted to do the London to Brighton bike ride there was no question as to what charity I would raise money for. Nick: I like the idea of going abroad and directly helping people in need and getting the satisfaction of knowing you will make a difference rather than just giving money to a charity. How did you train for the bike ride? Becky: I started training in March and I could have started earlier if it wasn’t for all the snow! Starting was slow and initially I started just by cycling to and from work although, as I live on Reigate Hill on the North Downs, the 4-mile ride to work and back again was a rather good start. I then went into full swing with training by cycling to work on weekdays and taking time on the weekends to go on long cycles in the Surrey Hills or along the Brighton coast. As the training progressed I got fitter and could go faster and longer. It now only takes me 8 minutes to cycle the 2 miles to work in the morning and only 12 minutes to get back in the evening (give me a break – it’s mostly uphill on the way back!). I was also able to increase the length, difficulty and distance of my weekend rides. Going from just 10 miles along the Brighton prom to a 23-mile ride around the Surrey Hills including part of the route that the cyclist did at the Olympics. Although I did have to stop for a breather a couple of times on the zigzag road on Box Hill (but who can blame me?). What were the highs of training? Becky: The feeling of achievement after having done a long ride or beating my personal best for my morning ride to work or evening ride back. I’m a very competitive person so any time I beat my husband is also a high point. However, he has always been a lot fitter than I am so this doesn’t happen very often. Tell us about the ride itself. Becky: We set out from Clapham Common at 9.30am, filled with excitement and apprehension. There was a lot of queuing to get out of London but we didn’t mind much as the atmosphere of the people around us was great and frankly it forced us to take it slowly. The hills were a bit bothersome for many reasons; one because there was a lot of up and little down, and two because almost everyone got off and pushed on them so it was impossible to get up them quickly. There was a few times that were well worth the hard work though. This included the really steep downhill bits where I could go as fast as I would brave (hit 35mph on one of the hills in Brighton!) and the support from cyclists and spectators alike. Why do you think fundraising for charity matters? Becky: We are very lucky to live in a country where we get free, good-quality healthcare, schools and other public services and live to a very high standard of living compared to a lot of places in the world. I therefore think it’s only fair that we help and support countries and communities that are not so lucky. I would love to think that by getting on my bike, getting fit, and having a fabulous and memorable day, I may have helped to change somebody’s life for the better. 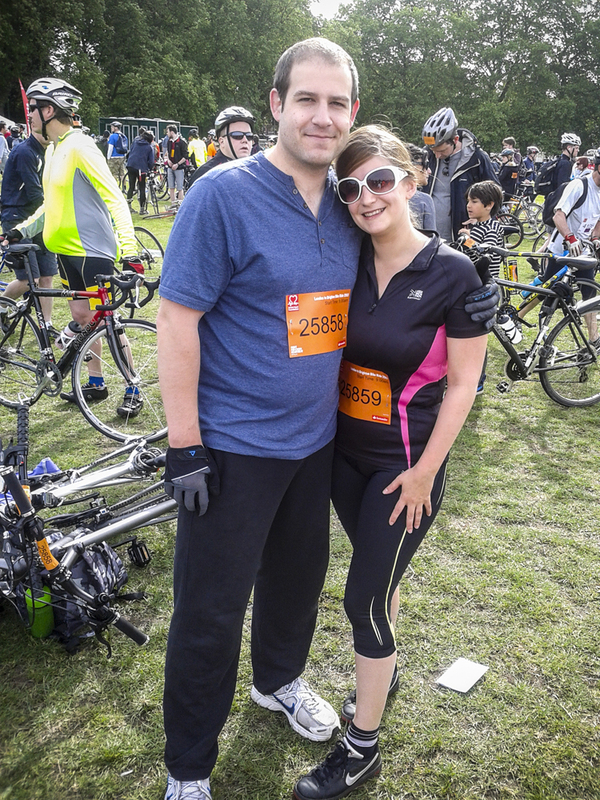 You are currently reading 2013 Fundraising: Nick and Becky Boulton’s London to Brighton bike ride at TWOWEEKS.